No matter what the weather does, June includes the longest day – the 21st – and the light nights and hopefully higher temperatures means that the weeds and the lawn will be growing fast. June is a month when even the most unenthusiastic gardener will have to do some work – if it is only hoeing and mowing – but there are great results in June for anyone who has put in even the minimum of work over the year so far so it is important to also have a sit down and take the time to enjoy the view. Once May is over, a frost would be quite a freak occurrence so everything which may have been kept inside can go out into the garden now. Containers and hanging baskets can go into their summer positions without having to worry about weather damage although if you had disappointing results from hanging baskets last year you may want to look at where you position them. Winds can do a lot of damage to a hanging basket, not only breaking off plants at the root so they die back completely but also by burning leaves so the plants don’t thrive. Wind will also dry out a hanging basket and as it is hard enough to keep them adequately watered at the best of times it might be best to move them. There are additives that can help keep moisture in the soil, but a wind free site is better still. It may seem a little early to be planning for next year but if your herbaceous border is your pride and joy you need to be always thinking ahead. You might start to notice a few thin patches in June when plants should be approaching their most lush. If there are still gaps you can plug them for this year with a few judiciously placed bedding plants, but for the long term you should be thinking of permanent replacements. These could come from elsewhere in the garden if you have some plants that are crowded and need dividing. If they are not ready to divide right now, you can label them and do it later. This might on the other hand be a chance to choose something new for the bald patch. Looking through seed and plant catalogues might give you the inspiration you need for an overhaul later in the year. And on the subject of planning ahead, June is the perfect month for sowing spring bedding such as wallflowers and pansies. If you like to have winter bedding plants you can plant those too – ornamental cabbages and winter pansies do so much better in the cold ground if they are well grown before being planted out in the autumn. If you have been averting your eyes from the dying foliage from the spring bulbs, June is the month when you can finally cut it back. Make sure it is totally yellow and dead before you do so but even if spring was late, the leaves are usually dead by the end of June if not earlier. If you noticed that the bulbs were coming up rather crowded, you can lift them and divide them now – while you can still see the foliage is a good idea and you can kill two birds with one stone. Clematis and other perennial climbers are beginning to look a little leggy and tatty as June comes in and so tidying them up is a good way to spend a lovely summer evening. The work is not hard but the whole area will look better for a trim. The same applies to herbaceous plants – time taken now to dead head and generally tidy them up will mean more flowers and a neater plant, less prone to wind rock. If you have a good display of pinks you can make yourself some more plants in June by one of several ways. You can snap off a non-flowering shoot easily with your fingers and put it in water to root – this is fun for children to get involved in – or you can root it in sandy compost in the greenhouse or on a windowsill. If you have room around the plant you can stake out some runners using a piece of bent wire or an opened out paperclip. All you need to do is break or snip a joint and hold it down in the soil with the wire and you will soon have another plant which can be left where it is to help the clump spread or taken up gently when rooted and moved elsewhere. Many flowering shrubs in the garden such as Mock Orange (Philadelphus) and Weigela will be more or less over by the end of June and it is a good plan to prune them back as soon as the flowers are over. If you leave it for later you might do so at the cost of flowers next year as they carry their blossom on ripened shoots from the year before and this needs time. At this point you can prune back reasonably hard to keep a good shape knowing that the new shoots will have time to develop. While you are pruning you can also pick out some shoots to take as cuttings. Fuschia, Mock Orange and spirea are good plants to try this with, or you could layer instead. Wisteria is a particularly good candidate for this and if you want to spread it further along a wall or fence this is a good way to do it. Ask most people what they enjoy most about summer and they will say the smell of new mown grass. Ask them what they hate most and those same people will say mowing the lawn! It is true that sometimes in summer the lawn seems in constant need of mowing but doing it frequently when it needs it is not only an easier way to mow but also strengthens the grass. If your lawn is large and you get loads of clippings every time you mow it, don’t be tempted to just put it on the compost in one big heap. All that will happen is that the compost heap will get slimy and smelly because grass clippings compact down too tightly and the air can’t get in. Adding it in thin layers with other compostable materials in between is the best way to manage your compost heap. Don’t feel bad about getting rid of clippings by taking them to the tip or putting them out for collection. Many councils have a compost heap of their own which are so huge that lawn clippings don’t compact down and will make great compost. You can then buy local compost which will probably have some of your clippings in it and because of the high temperatures reached in big heaps it is probably some of the best compost around. And very environmentally friendly too. If you are a fan of soft fruit, June is the month for you! If you are lucky enough to have a cherry tree, it will be fruiting now and there is nothing nicer than to sit in the sun under a cherry tree eating a bowl of sun warmed fruit. Strawberries and raspberries will also be coming into fruit now and even if you only have very little room, every gardener should try and squeeze in these fruits, just for the pleasure of eating them straight from the plant. Delicious anyway, they are best of all like this. If you are planning a fruit garden for next year, make sure you choose some of several varieties to sow as seed or buy as plants or canes so that you have a longer season of fruit. Many vegetables can be planted now outside where they are to crop. Salad crops can be planted in small batches to make sure they are always young and fresh but you can also plant out beans – French,broad and runner – out in trenches. Make sure there is plenty of well-rotted manure in the trench which feeds the plants as well as making the soil less prone to drying out. Placing the stakes for runner beans when you plant the seeds is a good idea. 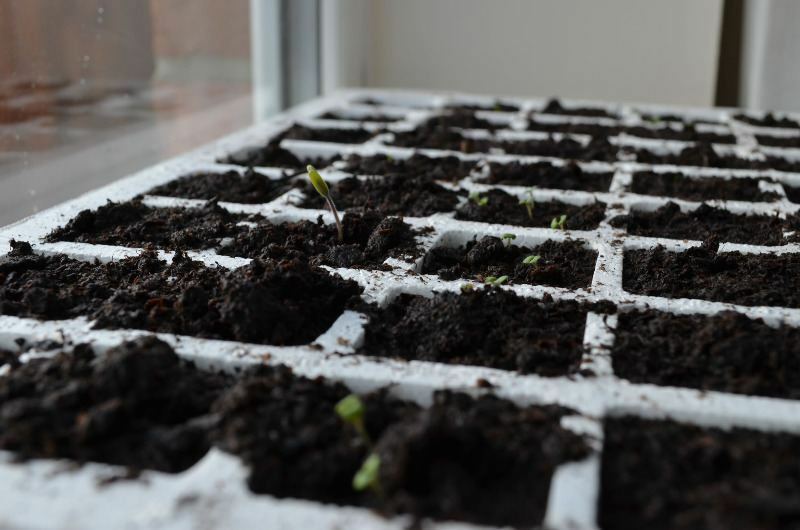 Cucumbers, squash, courgettes and marrows can also be planted out in June and if you have a gap in your winter brassica patch, why not fill it with a single ridge cucumber plant or perhaps a square of lettuce or radishes. Even in a large vegetable patch it seems a shame to waste space and of course ground with plants growing in it doesn’t have to be weeded – a real plus in June when the weeds are growing nineteen to the dozen. If you didn’t get round to planting seeds last year or earlier in the spring, don’t despair. June is a great time to bring on small plug plants to put out later in the summer. If you have a greenhouse or a cold frame you can get them going well so that when you plant them out they won’t be checked so much and you will soon have a good display. If you have a lot of bare earth and you really don’t know what to do with it and can’t afford loads of bedding, it is not too late to sow some wildflower seeds. Mix with lawn seed and sow broadcast – the colours will be random but the effect is lovely and very summery. © Copyright MOOSE SEEDS 2019. All Rights Reserved.